So fascinating that if you like guns at all you will be unable to lay it down - so valuable that if you think only about guns, you might consider becoming a bachelor again before parting with it! Between its covers are the jewels and gems, the intimate trade secrets of the country's leading full-and part-time gunsmiths, writers and basic authorities - proving that no one man can know all the answers - written in the language of the gun shop - so "gunsmithy" it even smells of bore cleaner. Collected and squirreled away by Bob Brownell during 30 years association with the nations best! Edited by Frank Brownell. 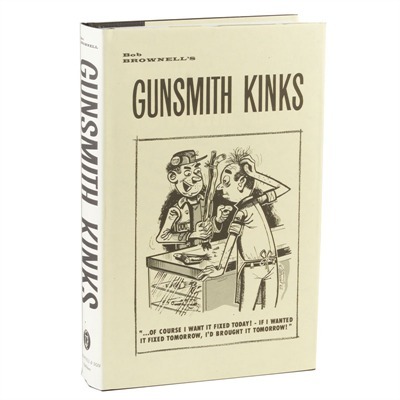 Published by popular demand of the professional gunsmith trade for their own in-shop use. FOR THE HUNTER - it is worth its weight in gold - just one of the many in-field "Service Kinks®" by someone who has already solved the problem could save your hunt! FOR THE TARGET SHOOTER - Any of the numerous accuracy gimmicks by the men who build the winners could bring those extra points for you when the chips are down. FOR THE HOBBYIST - A Mother Lode of ideas and suggestions 100 men couldn't live long enough to develop. You will revel in the many ways to handle those touchy jobs that can cost you hours of work or a ruined gun if you don't know the answer. Here is how the gunsmiths do those wondrous jobs. Knowing is understanding and appreciating their great skill and unbelievable ingenuity. More than ever, you will wonder how they can do it so beautifully without charging more! A Book you will truly treasure! Especially written, detailed, illustrated "how-to" articles in such special fields as . . . The Art of the Master Metal Polisher ... Basics of Engraving ... Rust and Chemical Bluing ... Tool Sharpening by the Masters ... Barrel Turning and Chambering ... Regular and Electric Checkering ... Stock Designs, plus many, many more. 317 Detailed photographs, blueprints and drawings - 504 pages with 609 separate subject headings. Deluxe, heavy-duty, hard cover, sewn binding. Buckram-linen cover. 1268 entry Cross Index! Plus, all the jokes the gunsmiths have laughed at over the years. Recipes for foods that have tickled their gullets, and cartoons that have tickled their bellies!